Six Flags Entertainment Corp. is the world's largest amusement park corporation based on quantity of properties and the fifth most popular in terms of attendance. The company maintains 14 properties located throughout North America, including theme parks, thrill parks, water parks and family entertainment centers. In 2009, Six Flags properties hosted 23.9 million guests. 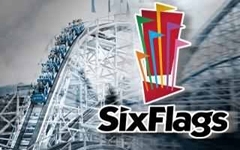 Six Flags offers a variety of entertainment including roller coasters, water rides, kiddie park, great food and spectacular shows for the entire family.